Pune's bus service has become the fifth Indian transit agency to offer schedules and route information on Google Transit. Screenshot from Google Transit. The new Mayor of Toronto’s subway plan will serve fewer passengers, not be cost efficient, and be less environmentally sound than the originally proposed light rail, according to several reports. Unlike almost every other developed nation, the United States has no national transportation strategy and is being passed up by the rest of the world, points out Bloomberg’s James S. Russel. After their removal from city streets 50 years ago, streetcars are making a comeback in Minneapolis. A $900,000 grant from the Federal Transit Administration may make them a reality again. The U.S. has become “a nation of walruses” and needs to make streets safe enough for bicycles, says The American Conservative Center for Public Transportation. San Francisco secured funding for a regional bike-sharing program that will team up city and local agencies from “The Golden Gate City” to San Jose. The program will offer 1,000 bikes and 100 kiosk stations around the Bay area. Transportation has become one of the fastest rising costs of living in New York City in 2010. Janette Sadik-Khan has been the key player in delivering dedicated bike lanes, cycle sharing, and pedestrianized streets in New York City. The Guardian profiles the city’s transportation commissioner in a recent post. Motorists have declared “war” against pedestrians and cyclists on London’s streets and sidewalks. Who’s battling back?, asks George Monbiot of the Guardian. Roads don’t pay for themselves and, in reality, have sucked $600 billion out of the public’s pocketbook since the creation of the U.S. interstate system, according to new a study. Manhattan and Queens in New York City are seeing parking meter rates going up from $2.50 to $3.00 per hour. All meters across the city are expected to switch to the new rate by June. Electric car sales may have slowed down, but there are still many EV drivers out there. CNN profiles one such alternative car commuter. Toyota has set high hopes for the Prius hybrid vehicle to be the top seller in the U.S. auto market by the end of this decade. The EPA-approved permittance of 15 percent ethanol content in gasoline has perturbed both oil and environmental groups because of ethanol’s and methanol’s corrosive effects on metal, of which all engines are made. CityVille, a new online game that challenges users to build a community from a rural plot to a bustling megapolis, has replaced sister app FarmVille as the most popular Facebook app. The game has more than 16 million daily users. Russia’s first hybrid vehicle was showcased in Moscow. The ‘Yo’ produced by Yarovit Motors is set to go on sale in 2012 for around 450,000 roubles (about $14,500). 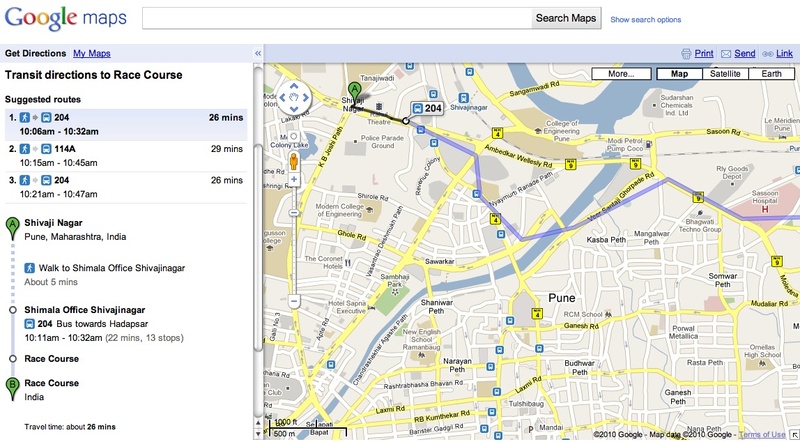 Pune’s schedules and route information for its bus service can now be found on Google Transit. The Indian city is the fifth to open transit information to the online service, following Chennai’s MRTS, Delhi’s Metro Rail, Kolkata’s Metro, and Bangalore’s Metropolitan Transport Corporation.